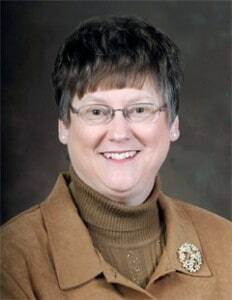 The newly opened Health Sciences Center (HSC) at Cedarville University is home to several new learning technologies for nursing and pharmacy students. These technologies help students develop skills, knowledge and confidence between their classroom instruction and hospital and lab experiences, making them better equipped to serve their communities effectively. 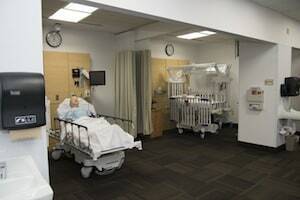 The third floor of the HSC is home to the simulation centers that will be used by nursing and pharmacy students. New for this year are two high-fidelity simulators: SimMan® 3G and SimMom™. Both are lifelike mannequins that act like a human would in a wide variety of programmable situations. SimMan 3G can simulate patients with a variety of health problems. For example, he can be programmed to have a seizure, severe medication reaction or an asthma attack. His ability to perspire, cry, and react with circumoral cyanosis (blue lips) when his oxygen levels are too low add to the realism of the clinical situation. “It’s pretty amazing technology,” said Connie Ford, F.N.P. and associate professor of nursing. When activated, SimMan3G’s chest rises and falls, he can cough and can complai n about discomfort, all controlled by the professor in the control room. When given medication, he will react as a normal patient might, depending on the nature and dose of the medication he has been given. Also new for use this year is SimMom, an advanced, interactive birthing simulator. This simulator allows students to practice the birthing process with a lifelike mother and baby. 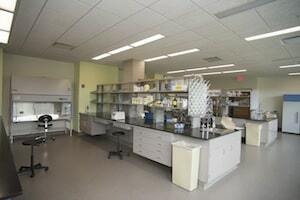 Several labs in the HSC are helping to enhance the pharmacy experience at Cedarville University. Research, pharmacy skills and clinic labs each play an integral role in developing student confidence before they receive practical experience in a pharmacy. At the same time, they help to develop student and faculty mindsets toward service. In addition to helping students, the new labs assist faculty in research. According to Sweeney, the research lab includes multiple pieces of equipment intended to enhance faculty research. Technology is ultimately a tool to help make both students and faculty stronger practitioners.